Crystal Bluffs offers extensive Rehabilitation Therapy services. Our licensed therapists' goal is to help residents regain the highest level of functional independence. 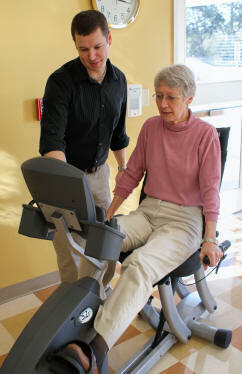 Physical Therapy to help residents build strength and improve mobility. Speech Therapy to help residents communicate and regain functional swallowing abilities. Occupational Therapy to help residents regain independence with dressing, bathing, and feeding themselves. In addition to our long-term care services we also offer short-term care. We can help residents who may need rehabilitation therapy following surgery, accidents, or illness return home quickly and safely as soon as possible. When a complete recovery from an injury or other condition is not possible, our occupational therapists assist residents in learning the necessary skills and techniques for continuing an independent lifestyle. Through a personalized regimen, our therapists help residents adapt their everyday routines and environments to allow the greatest amount of freedom and self-reliance possible.